Here are some solid dividend payers with very different payout schedules. Here in North America, most dividend-paying companies deliver their payouts on a quarterly basis. Every three months, you get another slice of the underlying company's cash flows. But the quarterly cadence is not written in stone. For example, Walt Disney (NYSE:DIS) announces its dividends on a semiannual basis. In effect, those quarterly checks are paired up and sent out once every six months instead. Just a couple of years ago, Disney's dividend arrived as a lump sum once a year. So the House of Mouse is actually accelerating its payouts if anything. Give it another few years, and maybe it will join the rest of the market in sending out quarterly dividend checks instead. And if that doesn't suit you, a handful of stocks actually send out smaller dividend payments on a monthly basis instead. I even found a couple of tickers in this rare category that look like solid dividend-paying buys right now. Let me introduce you to Canadian cable company Shaw Communications (NYSE:SJR), retail-focused REIT Realty Income (NYSE:O), and equity investment firm Main Street Capital (NYSE:MAIN). All of these companies send out monthly dividend payments. Income investors love two things above all else: stable dividends backed by solid cash flows, and a strong commitment to boosting those dividend payouts every year. Real estate investment trust Realty Income goes above and beyond these ideals with a monthly dividend that has seen more than its fair share of payout increases. 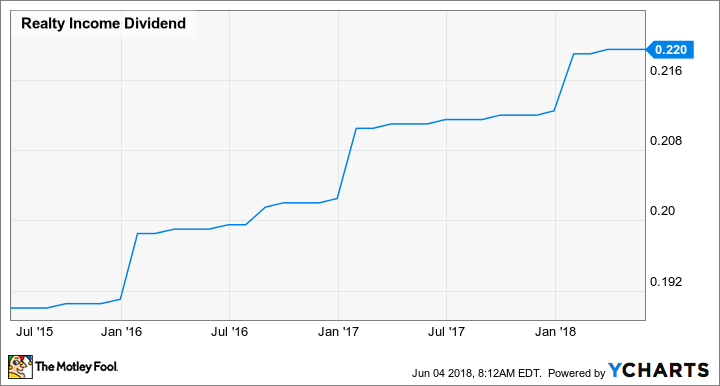 Realty Income's stock currently carries a 4.7% dividend yield. If you're looking for both dividend checks and dividend boosts at uncommonly high frequencies, Realty Income would be a great place to start. Main Street Capital is a different story. The company provides funding for small and medium businesses with promising futures, often in return for some equity in the businesses it funds. The resulting cash flows are funneled into two categories of dividends. MAIN dividend data by YCharts. The total dividend yield currently stands at a generous 6.1%. The company invests in a diverse bunch of businesses, including music and clothing stores, brand managers, and even a bit of cryptocurrency speculation. It's an interesting investment idea, to say the least. Canadian cable company Shaw Communications is another unique dividend play. The company pays out its dividends on a monthly basis but announces them on a quarterly schedule. In other words, four dividend announcements per year cover a total of 12 monthly checks, in batches of three payments at a time. Shaw's dividends don't always rise on a month-by-month basis, as the company fine-tunes its payouts to suit the cash flow needs of each quarter. The three payments per batch are rarely the same amount; sometimes they rise, and sometimes they fall. But the company's stated goal is to generate strong cash flows to power dividend growth over the long term. The company has expanded into wireless services in recent years to stay relevant in this cord-cutting era. The flexible dividend policy is helping Shaw adjust to changing market conditions without scaring away investors and analysts. 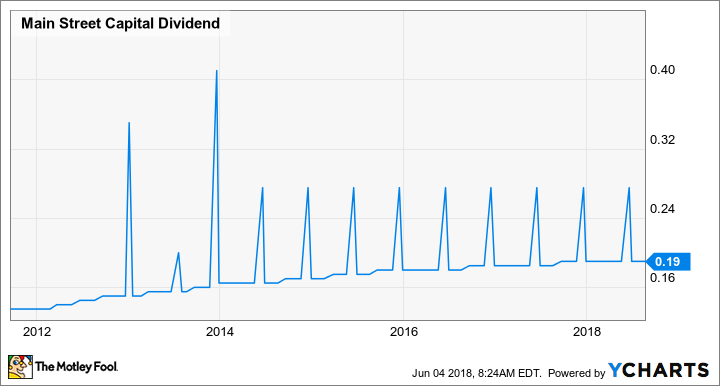 Today, Shaw's trailing dividends stop at $1.00 per share, but the annualized payouts of the most recent batch rose to $1.19 per share. That's an effective yield of 5.9%, paired with a limber management style that should keep Shaw in business for decades to come.